The following games are all winners of the prestigious "Mensa Select" award, bestowed annually by the American Mensa Society. Each year, the Mensa Mind Games event is held somewhere in the United States. Mensa members are invited to play and judge the games which have been submitted to compete for the award. The five most popular games based on originality, game play, aesthetics, play value, and clarity of instructions receive the Mensa Select distinction, an award coveted among game manufacturers, and a symbol of quality for game players around the world. Forbidden Desert — Gear up for a thrilling adventure to recover a legendary flying machine buried deep in the ruins of an ancient desert city. Find the flying machine and escape before you all become permanent artifacts of the Forbidden Desert! KerFlip! — KerFlip is the award-winning, shoot-from-the-hip style word game that rewards players for making words faster than their opponents can. KerFlip is easy to learn and completely original. 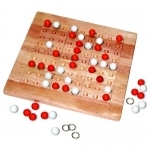 Kulami — Kulami is a fun, tactile game of strategy for two players. Ten wooden tiles are arranged to form an ever-changing board on which opponents compete to capture the largest number of tiles. Suburbia — Plan, build, and develop a small town into a major metropolis. Suburbia is a tile-laying game in which each player tries to build up an economic engine and infrastructure that will be self-sufficient, profitable, and encourage population growth. Iota — Iota is a compact card game in which players compete to score points by playing cards whose three attributes individually are either all the same or all different. Sounds easy, but as the grid expands, so do the possibilities! Snake Oil — In the Old West, the wily snake oil salesman had a special talent, getting the most skeptical customers to buy the most dubious-sounding products. Believe you me folks, Snake Oil will cure your doldrums and have your friends and family rolling in laughter! Anomia — Where common knowlege becomes uncommonly fun! Forbidden Island — Join a team of fearless adventurers on a do-or-die mission. Word On The Street — The hilarious tug of words will have you on the fast lane to fun! Dominion — You assume the role of a monarch, as your parents before you. Marrakech — The bazaar is bustling: it's the big day at the rug market! Tic-Tac-Ku — A great new adaptation of the old classic Tic Tac Toe. 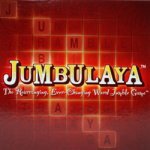 AmuseAmaze — At last a word game where words don't have to be biggest to be best, and where even little words are winners. Eye Know — It's time to put your visual memory and general knowledge to work in this visual trivia game. 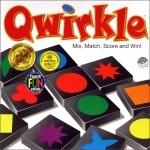 Qwirkle — This tactile wooden block game combines the logic and strategy of Set with the creative multi-maneuver game play of Scrabble. Hive — Surround your opponent's queen bee while trying to block your opponent from doing the same to your queen bee. Wits & Wagers — A fast-paced party game with a unique combination of trivia, gambling, and social interaction. Da Vinci's Challenge — This game uses ancient symbols to create patterns and pictures to outsmart your opponent. Loot — Set sail for an exciting adventure of strategy and skullduggery in this captivating game. Niagara — Players move their canoes up and down the Niagara river to pick up gemstones. Blokus Classic — A fascinating strategy game for the whole family, very easy to learn, yet challenging to play. Fire and Ice — A strategic, move-and-place game with shifting strategies and complexities. Dvonn — A challenging stacking game with very simple rules - control as many pieces as possible by building stacks. Curses! — Players take turns drawing cards and putting "curses" on each other. Time's Up! — Race though three fun-filled rounds to guess the most celebrities in 30 seconds. Apples To Apples - Party Box Edition — The wild, award-winning party game that provides instant fun for four to ten players. Fluxx — The card game with ever-changing rules! Sounds complicated it's really quite simple. Quiddler — A fast-paced game you can play using everyday words. El Capitan — You are a merchant in the 15th century, sailing to important cities of the Mediterranean. Quoridor — Can you get your pawn across the board and block your opponent from doing the same? Rush Hour — A sliding block puzzle designed to challenge your sequential-thinking skills. Pirateer — There is treasure on the island and you have the map to it, but everyone else does too! Rat-a-Tat Cat — Rats are high, cats are low ... get rid of the rats and go for the cats! Duo — If you enjoy Uno, double your fun with Duo! Quixo — A modern version of tic-tac-toe. Inklings — The shorter the clue, the more points you score! Set — Get that grey matter churning as you try to find sets of three numbers, symbols, colors or shadings. 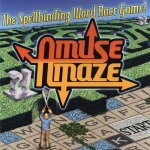 The Amazeing Labyrinth — Traverse the constantly shifting maze and collect your cards. Abalone — Loosely based on sumo wrestling, the goal of Abalone is to push your opponents marbles off the board.